$800,000 Prime commercial property located on the main thoroughfare in Nassau with 106' of prime road frontage and total 1.49 acres of land. Prince Charles Drive is a highly developed and desirable commercial location with medium to large industrious dwellings. Next to the property is a 30 ft. wide road reservation that would make this property a great shopping plaza opportunity in such a high impact location in the eastern area of New Providence. 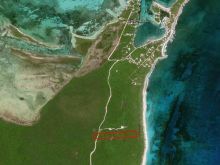 $800,000 A 2.648 acre tract of land starting on the main Bernard Road Fox Hill with a 2,752 Commercial Building situated thereon, immediately west of the old Lovers Holiday Club. The property stretches back on a Hill Top close to Freddie Munnings Manor Subdivision on Frank Edgecombe Drive (formerly Springfield Road). The property also contains a 4,424 Sq. Ft. Six Unit Apartment Building partially completed up to Belt Course Stage. $795,000 Fantastic investment opportunity in the bustling hub of Marsh Harbour! Gross Revenue is $74,400.00 per year. Net operating income is $54,400.00 per year. Continue to rent to established tenants, or start your own business with accommodations right on the property! As areas of Abaco like Hope Town, Man O War, Baker's Bay, Guana Cay and Treasure Cay continue develop & become more popular than ever, Marsh Harbour has become an important source for supplies, shopping, labor, banking, transportation, accounting, legal needs, and much, much more! The Iggy Biggy complex is in the perfect location on Bay Street (also known as "Restaurant Row") comprised of 3 separate retail pods, with a combined retail space of 1,982 sq. ft. On the south end of the property is a lovely 2-story apartment building totaling 2,048 sq. ft. The second floor apartment is 1,024 sq. ft., with 2b/1b. The ground floor apartment is 644 sq. ft. with 1b/1b. Also located on the ground floor is 380 sq. ft. of storage space which is currently rented to one of the retail tenants. $760,000 Two storey commercial building with 4 two bedroom one bathroom apartments upstairs. Apartment are being rented on a yearly basis at the rate of $800 per month. Downstairs is divided into 4 commercial spaces that are being converted into apartment units to take advantage of the need for residential rentals. The completion of this conversion would be completed by the purchaser. Paved parking is provided at the front of the building. The property is quite attractive, is enclosed with fencing at the side and rear boundaries and an attractive low planter wall at the front planted out with tasteful plants. $759,000 These two double-storey apartment buildings have a total of 16 one-level apartments and are located in Dannottage Estates. There are Thirteen (13) one-bedroom apartments consisting of a living/dining room, kitchen, bathroom, and a walk-in closet and Three (3) two-bedroom apartments consisting of a living/dining room, kitchen, bathroom, and a walk-in closet. There is a community laundry facility and ample parking for tenants. The apartments are consistently occupied making them an attractive option for investors. $755,000 Description. Location, Location, Location.This may be one of the few large commercial parcels being sold in the downtown area in a very long time and under $1.0M. Offering 432 linear feet of frontage, this lot is Ideal for commercial or mixed use development as the original building was once an apartment complex then it was converted to a professional office complex. This lot is one block from the town center and just two minutes from banks, attorney and utility companies. This is a one time opportunity to have a large parcel that will allow you to maximize rental opportunities for many years to come. $750,000 5 Acres on Marigold Farm Road off of Joe Farrington Road ready to be utilized for your commercial needs. Perfect to create church, storage center, distribution center, warehouse, or any other commercial uses in the east of Nassau. Utilities available and perfect for development. At $175K an acre this a steal of a deal and won't last long! Property is located north of Continental Foods off of Joe Farrington Road. At $150K per acre this is a great value! $750,000 Located on the junction of two of the busiest streets in the country sits this stately commercial property. With over 10,000 square feet your building options are many. Come take a look at this lot a little closer and see if it fits your needs. $749,000 A beautiful 10 + acre Estate on Joe Bookies Bay located just one mile south of the much sought after Little Harbour enclave with Pete's Pub and sculpture foundary with the very exclusive and private Abaco Club to the south. The Estate is 200 ft wide x approximately 2185 ft in length. Excellent elevation with fabulous views! The Estate can access the beautiful powder soft ocean beach which is only 70 ft through the crown land strip. Tremendous development opportunity for a main house and rental cottages or for a large private home and guest house. $685,000 Commercial opportunity in the hub of western activity just three minutes from Nassau's International Airport. 2,500 square feet of commercial space split over two floors inclusive of his/her bathrooms, and ceiling lighting. Dual entry provides for customer facing to the front, and service delivery to the rear via a roll-down door. Solid block construction, double glazed, hurricane resistant windows offers maximum security and sound insulation. Landscaped surrounding areas, ample parking and 24-hour security makes this area a prime location to situate any business. Available for purchase or lease. Windsor Business Park is an up and coming commercial community located on Windsor Field Road.